With heavy fog blanketing the forest, we pick our way through the twisted pines, following a well-worn trail as it snakes out onto a rocky outcrop. A light rain falls, and everywhere is grey. We’re walking out into a cloud, and even though we can’t see it we know we’re now hundreds of feet above the ground. We reach the edge and stop by a gnarly tree jutting out from the rock, disappointed we can’t see more than ten feet into the abyss. We can feel and hear the emptiness all around: raindrops falling silently into a void, distant streams rushing far below. And then, in one of those rare, ethereal moments you never forget, the clouds begin to swirl and clear, slowly revealing what must surely be one of the most surreal and beautiful landscapes on Earth – an archipelago of tree-covered islands floating on an sea fog. 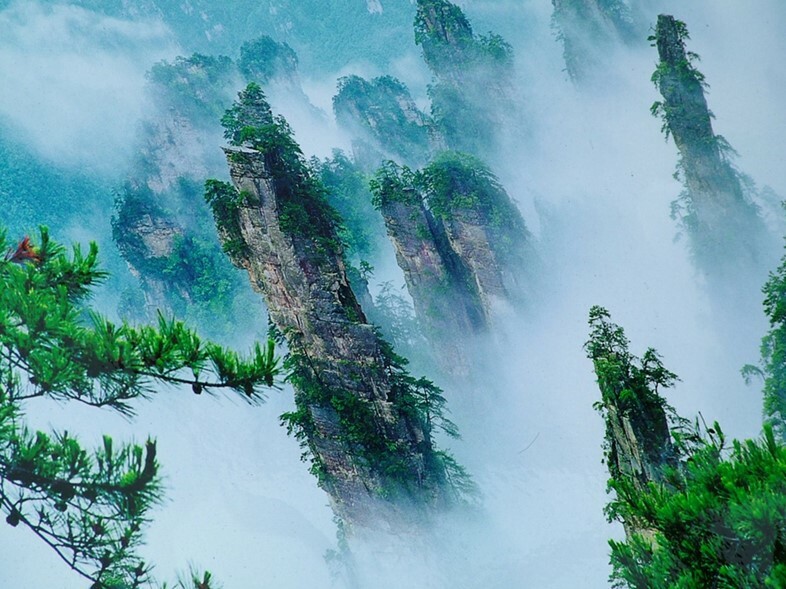 The floating ‘islands’ of Zhangjiajie that we’re gazing out over are just the tips of an immense geological wonder – a vast system of stone pillars rising from the river valleys below. The combination of dense forests, deep gorges, towering peaks and craggy, wind-swept trees has been drawing artists and hermits, fugitives and travellers to the area for centuries. 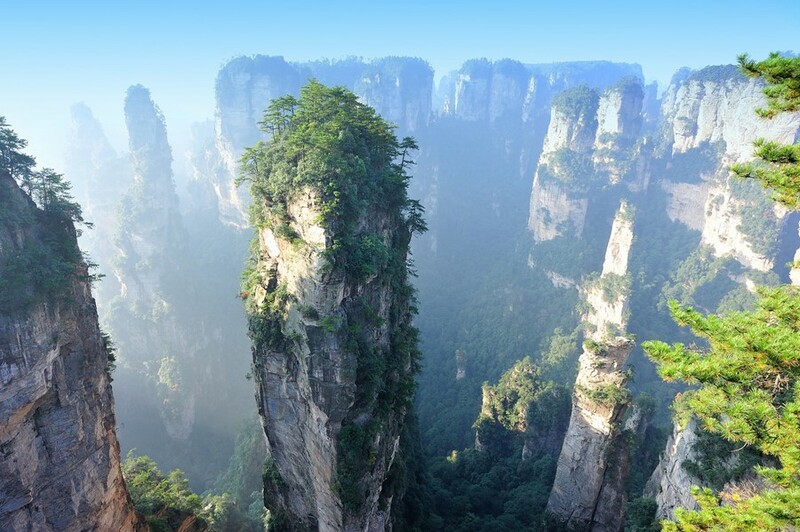 Now a UNESCO World Heritage site and (as the tourist shops ceaselessly proclaim) the place where they filmed the ‘hovering islands’ scenes in Avatar, Zhangjiajie is rightly taking its place alongside the Grand Canyon as one of the most awesome natural excavations on the planet. 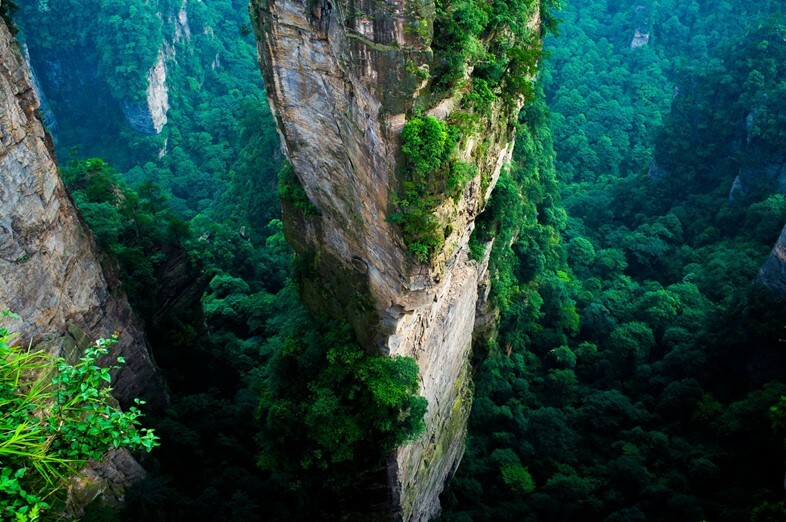 Zhangjiajie’s incredible landscape began to form over 60 million years ago, when warm tropical seas covered the land. In places, the deep seas formed limestone while in shallower regions hard quartz sandstone predominated. The seas slowly receded and eons of rains and rivers wore away at the softer stone. Small outcrops began to appear; craggy and covered by trees. The action of their roots and the constant freezing and melting of ice as winters passed inexorably carved the towering pillars, which aren’t smooth and eroded but angular and rough. Today, there are over 3000 individual towers – some rising a thousand feet into the sky. Perhaps most spectacular is the way these towering mesas have been colonised by plants, creating a vast world of high-rise ecosystems that brim with life. The national park is home to 3000 plant species and 500 types of tree, including the Dawn Redwood which was thought to be extinct until it was rediscovered there in 1948. The make-up of this dense green vertical world changes as it rises – evergreen broadleaves dominate below 700m, giving way to a mixed community of evergreen and deciduous broadleaved trees. Chinese plum yew and pines abound further up, with the latter clinging on alone in some of the highest and most remote peaks. Standing on the right side of sturdy safety fences, the urge to fire a rope across or scale one was almost overwhelming. As the clouds once again closed in and islands slowly disappeared again, we couldn’t help but imagine spending a week, a month, a year or a lifetime atop one of the seemingly infinite floating worlds, alone, in the silence, amid the sky. 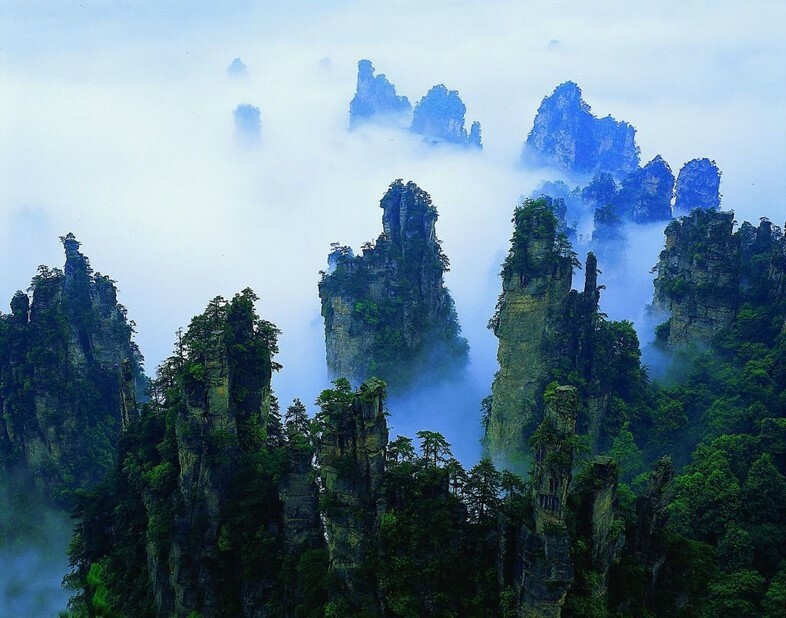 Zhangjiajie is located within the Wulingyuan Scenic and Historic Interest Area, which is also home to scenic lakes, limestone caves and the Zhangjiajie Sandstone Peak Forest Geopark. Travelling there by high speed train from most parts of China is cheap, fast, easy and more environmentally responsible than flying. 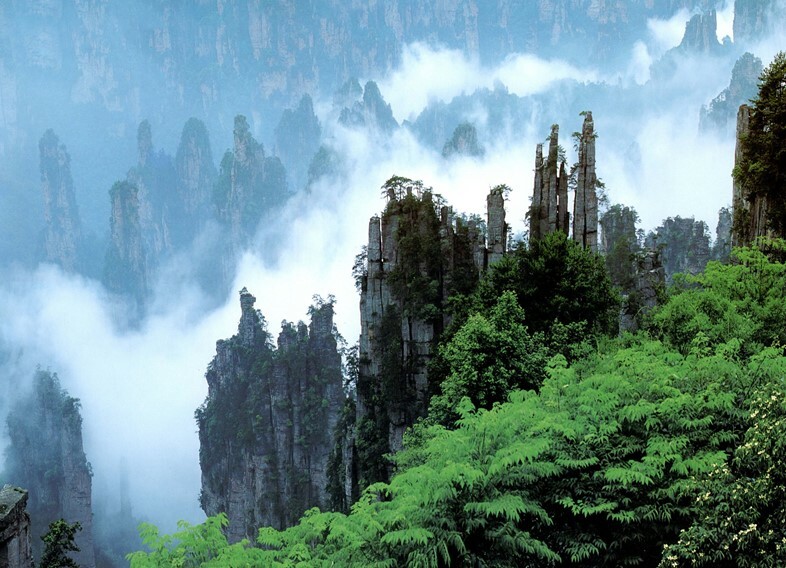 Like many attractions in China, Zhangjiajie can get busy, so plan to visit early and late in the day, and try exploring the smaller side trails – where you can still find utter peace, silence and tranquility.